The countrywide average auto insurance expenditure rose 5.3 percent to $935.80 in 2016 from $889.09 in 2015, according to the National Association of Insurance Commissioners. In 2016 (the latest data available), the average expenditure was highest in New Jersey ($1,309.29), followed by Louisiana ($1,302.11), and New York ($1,301.64). To calculate average expenditures the National Association of Insurance Commissioners (NAIC) assumes that all insured vehicles carry liability coverage but not necessarily collision or comprehensive coverage. The average expenditure measures what consumers actually spend for insurance on each vehicle. It does not equal the sum of liability, collision and comprehensive expenditures because not all policyholders purchase all three coverages. AAA’s 2018 Your Driving Costs study found that the average cost to own and operate a 2018 model vehicle was $8,849 in 2018. The average insurance cost for medium sedans was $1,232. AAA insurance cost estimates are based on a full coverage policy for a driver who is under 65 years of age, has more than six years of driving experience, no accidents and lives in a suburban/urban location for a policy with $100,000/$300,000 personal liability, $25,000 medical, $100,000 property and $25,000/$50,000 uninsured/underinsured motorist coverage, with a $500 deductible for collision and comprehensive claims. Figures are not comparable with the National Association of Insurance Commissioners’ Auto Expenditures data below. 77 percent of insured drivers purchase comprehensive coverage in addition to liability insurance, and 73 percent buy collision coverage, based on an I.I.I. analysis of 2016 NAIC data. 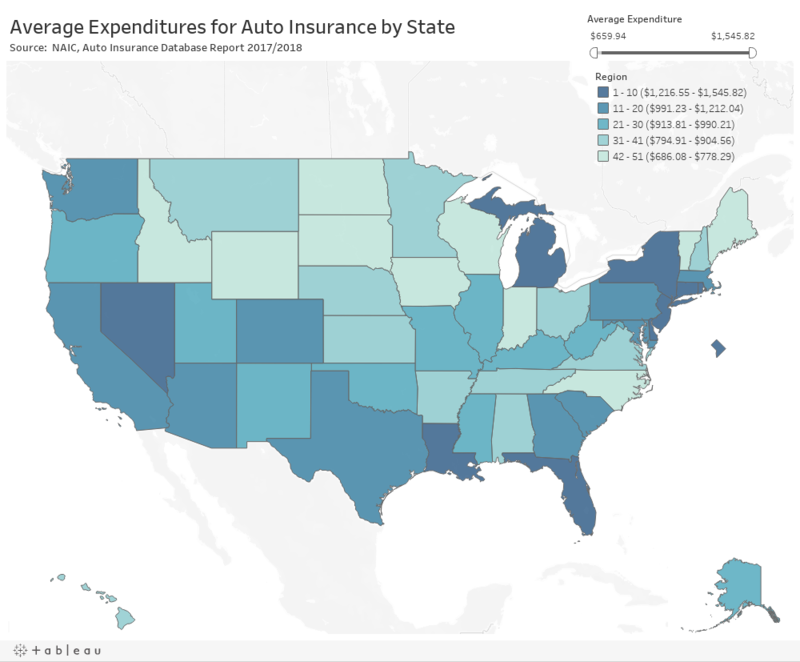 The tables below show estimated average expenditures for private passenger automobile insurance by state from 2012 to 2016, providing approximate measures of the relative cost of automobile insurance to consumers in each state. To calculate average expenditures the National Association of Insurance Commissioners (NAIC) assumes that all insured vehicles carry liability coverage but not necessarily collision or comprehensive coverage. The average expenditure measures what consumers actually spend for insurance on each vehicle. It does not equal the sum of liability, collision and comprehensive expenditures because not all policyholders purchase all three coverages. Expenditures are affected by the coverages purchased as well as other factors. In states with a healthy economy, people are more likely to purchase new cars. Since new car owners are more likely to purchase physical damage coverages, these states will have a higher average expenditure. The NAIC notes that three variables—urban population, miles driven per number of highway miles, and disposable income per capita—are correlated with the state auto insurance premiums. It also notes that high-premium states tend to also be highly urban, with higher wage and price levels, and greater traffic density. Other factors can also affect auto insurance prices. 2008 $94,545,647 -0.5% 103.5 1.7 pts. $64,054,581 -1.0% 95.8 2.4 pts. (1) After reinsurance transactions, excludes state funds. (2) After dividends to policyholders. A drop in the combined ratio represents an improvement; an increase represents a deterioration. (3) Calculated from unrounded data. Liability insurance pays for the policyholder’s legal responsibility to others for bodily injury or property damage. Collision and comprehensive insurance cover property damage and theft to the policyholder’s car. (1) For all limits combined. Data are for paid claims. (2) Excludes Massachusetts and most states with no-fault automobile insurance laws. (3) Excludes Massachusetts, Michigan and New Jersey. (4) Claim frequency is claims per 100 car years. A car year is equal to 365 days of insured coverage for one vehicle. (5) Claim severity is the size of the loss. (6) Includes loss adjustment expenses. (7) Excludes Massachusetts, Michigan and Puerto Rico. Based on coverage with a $500 deductible. (8) Excludes wind and water losses. In 2017, 1.1 percent of people with liability insurance had a bodily injury liability claim, while 4.0 percent of those with liability insurance had a property damage liability claim, according to ISO. In 2017, 6.2 percent of collision insurance policyholders had a claim, while 2.9 percent of people with comprehensive coverage had a claim. In 2017 the average auto liability claim for property damage was $3,638; the average auto liability claim for bodily injury was $15,270. In 2017 the average collision claim was $3,425; the average comprehensive claim was $1,817. (1) Losses occurring within a fixed period, whether or not adjusted or paid during the same period on a direct basis before reinsurance. All states and the District of Columbia use special systems to guarantee that auto insurance is available to those who cannot obtain it in the private market. Each type of system is commonly known as an assigned risk plan, although that term technically applies to only one type of plan. The assigned risk and other plans are known in the insurance industry as the shared, or residual, market. Policyholders in assigned risk plans are assigned to various insurance companies doing business in the state. In the voluntary, or regular, market, auto insurers are free to select policyholders. The percentage of vehicles insured in the shared market is dropping, in part because of the evolution of the nonstandard sector of the voluntary market. The nonstandard market is a niche market for drivers who have a worse than average driving record or drive specialized cars such as high-powered sports cars and custom-built cars. It is made up of both small specialty companies, whose only business is the nonstandard market, and well-known auto insurance companies with nonstandard divisions. Until the mid-1960s, most drivers who did not meet an insurance company’s “standard” or “preferred risk” underwriting criteria could only find coverage in the shared market, where prices are generally much higher and insurers pool or share the profits and losses. With advancements in computer technology that made it easier to set appropriate prices for smaller and smaller risk categories, some insurers began to specialize in insuring drivers with marginally bad driving records. By the late 1990s the nonstandard market accounted for about one-fifth of the total private passenger auto insurance market. This has held steady. A 2008 Conning study found that in 2006 auto insurers specializing in nonstandard private passenger auto insurance had direct premiums written of $36.9 billion, representing 22 percent of the total private passenger auto insurance market. (1) Less than 0.001 percent. (2) Texas information is no longer available. The chart below shows the claim frequency and average loss payment per claim and average loss payment per insured vehicle year under collision coverage for recent model vehicles. The claim frequency is expressed as a rate per 100 insured vehicle years. A vehicle year is equal to 365 days of insurance coverage for a single vehicle. (1) Per 100 insured vehicle years. (2) Includes claims from cargo/passenger vans. The Bureau of Labor Statistics consumer price index (CPI) tracks changes in the prices paid by consumers for a representative basket of goods and services. The cost of living (all items) rose 2.4 percent in 2018. The cost of motor vehicle insurance and hospital services rose faster (7.4 percent and 4.4 percent, respectively). The cost of tenants and household insurance rose 1.3 percent, and medical care rose 2.0 percent. (4) Only includes insurance covering rental properties. (5) Includes appliances, reupholstery and inside home maintenance. Note: Percent changes are calculated from unrounded data. Source: U.S. Department of Labor, Bureau of Labor Statistics; National Association of Realtors.